British parsnips are available in the shops for 11 months of the year, with the new season crop available from July. Thanks to their long UK season they are very eco-friendly as they are seldom transported from abroad. Similarly to other root vegetables their flavour intensifies throughout the year, making the later crop capable of standing up to stronger flavours in casseroles and the like. While there are lots of parsnip varieties available, in the UK growers tend to grow either the Gladiator variety, which has a more bulbous top, or the Javelin variety, with a more tapering shape. Both varieties are ideal for UK growing due to their reliability, damage resistance and producing a good yield. Growing best on free draining sandy soil, parsnips were traditionally grown in the East of the country on the Norfolk Sands, the Fens region and up on the Lancaster peats. Over the years this has altered with Nottinghamshire also becoming an important production area. The soil is prepared by sifting out all the stones and clumps of earth to avoid misshapen parsnips. A cover crop such as barley or wheat is drilled with the parsnip seed to protect the crop from wind damage and the fields are thoroughly irrigated to produce a good yield. They are sown with the aid of a precision drill which ensures the crop grows in a uniform pattern to maximize productivity and reduce waste. For parsnips, crop rotation is a particularly important. It is a lengthy process with fields being left for seven to 10 years. To ensure a constant supply of parsnips, many farms rent land from estates or neighbouring farms in their area. In preparation for winter, each autumn parsnip growers put some of their crop “to bed” by covering them with a thick layer of straw. Although parsnips are not damaged by frost and in fact taste even sweeter in years with a heavy frost, growers need to be able to pull the crop to deliver it to the shops. By covering around 20-30 acres of the crop at a time, if the ground freezes they can still pull parsnips from this area which remains at a constant temperature of between 5-9ºC. To ensure they sell the freshest, top quality parsnips most farms have their own pack house on site. This means that the parsnips can be harvested, washed, packed and on the supermarket shelf within 24 hours. Fifth generation parsnip farmer Rod Bartlett, and his father Roy, farm over 600 acres of prime Staffordshire land with its light sandy soils. 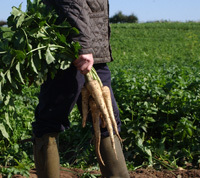 The Bartlett family started farming parsnips commercially in the 1950s when Roy’s mother acquired a small 50 acre site. Today the family harvest about 15,000 tonnes of parsnips a year under the company R&RW Bartlett, and supply them throughout the Midlands, as well as nationally and exporting to Europe. Their customers range from food service outlets such as Toby Carvery to independent wholesalers across the UK. They also supply Asda supermarkets and their parsnips go to a company who make parsnip chips too. The company farms, packs and markets parsnips and with Rod’s daughter Laura joining the business last year they look set to be supplying the nation with this wonderful vegetable for many years to come.